Meet the most adorable family ever at our Red panda exhibit! Our pandas hang out under the redwoods eating bamboo and sharing their grassy riparian habitat with an Indian muntjac. Our pair of pandas are part of a collective breeding plan and produced their first cub named Mohu in the spring of 2013, and another two cubs, twin sisters Cini and Masala, in July of 2014. If you are lucky, you may get to see one walking right in front of the view window – about as close and personal as you can safely get – or witness some keeper-guided panda painting! 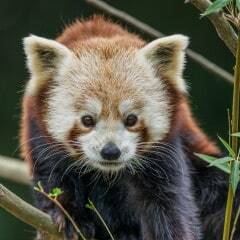 Red pandas are native to the mountain forests of Western Asia. They are nearly extinct in the western part of their range because their forest home is being removed for development. Our pandas are part of a worldwide effort to preserve this amazing animal for future generations through the cooperatively managed Species Survival Plan.